Knowing your heart rate zone reminds you to maintain a proper level of exercise intensity. Are you working hard during exercise — or hardly working? Guidelines recommend at least 150 minutes of moderate-intensity exercise per week. But "moderate intensity" can vary per person. What is an effort to one person can be easy to another. A good way to maintain your level of moderate intensity is with heart rate training, where you exercise at 60% to 75% of your maximum heart rate. This is your cardio Goldilocks zone where the intensity is not too hard or too light, but just right. "Heart rate training can give you an ongoing reminder of your intensity and tell you when you need to pick up the pace or slow down," says Dr. Aaron Baggish, director of the Cardiovascular Performance Program at Harvard-affiliated Massachusetts General Hospital. "This way you can stay within your moderate-intensity zone as much as possible." What is your moderate-intensity zone? First, you need to know your maximum heart rate — the upper limit of what your cardiovascular system can handle during physical activity — as measured in number of heartbeats per minute. One way to find your maximum heart rate is with a stress test, in which you walk or jog on a treadmill that makes you, and thus your heart, work progressively harder while an electrocardiograph monitors your heart's electrical rhythms. While this is the most accurate way to determine your maximum heart rate, a simpler option is to use a formula based on your age, which can offer a good estimate. Dr. Baggish suggests 200 minus half your age. Once you know your maximum, you can figure your target zone as 60% to 75% of that number. For example, a 70-year-old man would have a maximum heart rate of 165 beats per minute. Therefore, his moderate-intensity heart rate zone would range from 99 to 124 beats per minute. a five-minute cool-down to lower your heart rate to normal. It's also a good idea to stay in the low end (60%) of your target zone for a few weeks and build up to 75%. "Also, remember that if you're not able to carry on a conversation at any time while exercising, the intensity may be too much, no matter what your optimal heart rate zone," says Dr. Baggish. If you have difficulty staying in your zone for 30 minutes, do intervals: Slow your pace for a few minutes, and then increase the intensity until you reach your target heart rate zone again. Stay there for one to two minutes or longer, and then slow down again. Repeat the back-and-forth cycle for 30 minutes. "As your conditioning improves, you will be able to stay longer in your heart rate zone until eventually you can do the entire 30 minutes," says Dr. Baggish. Heart rate training is not for everyone. Talk with your doctor to determine if it is right for you. 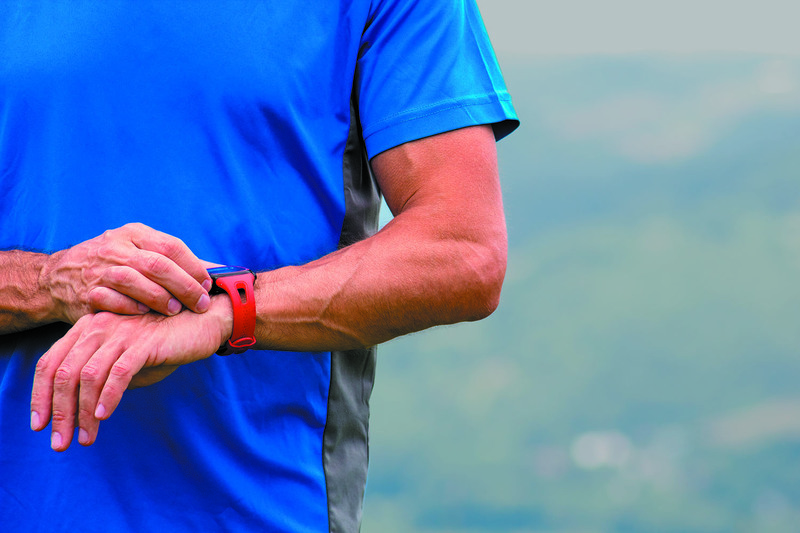 With heart rate training, you need to be able to monitor your heart rate at all times. "Forget the gym cardio machine monitors that measure your heart rate when you grab a sensor. They are notoriously inaccurate," says Dr. Aaron Baggish of Harvard-affiliated Massachusetts General Hospital. Instead, opt for a commercial heart rate monitor. There are two types: a system that combines a chest strap and a wristwatch, or a fitness tracker that measures heart rate. With the strap/watch combo, you wear a strap containing a transmitter around your chest with the transmitter placed near your heart. The transmitter picks up your heart rate and sends the data to a wrist receiver, which displays your heart rate. By contrast, the fitness trackers use optical sensors that detect light bouncing back from blood flow beneath the skin to measure your pulse. Which is more accurate? Research published in the January 2017 JAMA Cardiology compared a strap/watch monitor with four popular fitness trackers and found the strap system was 99.6% accurate, while the fitness trackers' accuracy ranged from 92% to 97%, and the trackers could be off by 15 to 34 beats per minute. Some people may still prefer the simplicity of a fitness tracker, but keep in mind its possible limitations and make the necessary adjustments.